The styling of the Toyota Tundra has been completely updated both inside and out for the 2014 model year which you’ll notice right away with the more muscular and chiseled front grille. Sales in the full-sized pickup truck market are booming this year and Toyota expects to grab its share of that market with the redesigned half-ton, full-size pickup truck. The 2014 Tundra will be available in 5 grades – SR, SR5, Limited, Platinum and a special 1794 Edition, which reflects a western lifestyle theme as a tribute to the ranch, founded in 1794, on which the Tundra plant is located in San Antonio. I traveled out to Knoxville, Tennessee for an up-close look at the new truck and a chance to drive it on a variety of roads. The redesign and the new front grille definitely enhance the look of the Tundra. It’s a great-looking truck as you can see from the photos above with the bold and powerful look that buyers expect in this segment. The Platinum version has a little less chrome and I liked that one the best, but buyers will have plenty of choices with the multiple trim levels. I liked the feature of having “TUNDRA” stamped into the sheet metal on the rear, and along with the new tail lamps the vehicle looks great from this angle. Toyota listened to customers who explained how they used the truck in rugged settings, so both the front and rear bumpers have been changed from one piece to three for lower replacement costs. Three cab styles are offered with the two-door Regular Cab, four-door Double Cab, and the super-sized four-door CrewMax. The Regular Cab and Double Cab models are offered in standard bed (78.7-inch) or long bed (97.6-inch) configurations and the CrewMax comes with a 66.7-inch bed, with all beds being 22.2-inches deep. Many upgrades were made to the interior to make it more refined. The interior is very spacious and comfortable, and in the Limited, Platinum and 1794 editions buyers will find the luxury items you expect in higher end vehicles. I liked the leather seats and leather accents on the dash, particularly in the Platinum edition which featured perforated, diamond pleated premium leather seats, door and instrument panel inserts. The center stack screen and controls were laid out nicely and easy to use. The upgraded Entune audio system and app suite is easy to use with some nice customization features. The rear seats in the CrewMax edition offer plenty of space for passengers and can now be folded up for additional cargo carrying capability as well. The engine options remain the same on the new Tundra, as Toyota executives explained that drivers would not see any real-world mileage gains with a turbo V6 offered by competitors. Toyota’s most popular engine is the 5.7-liter, DOHC i-Force V8 which generates 381 horsepower at 5,600 rpm and 401 foot-pounds of peak torque at 3,600 rpm with a six-speed electronically controlled automatic transmission. Fuel efficiency on 4×2 models is 13 mpg city, 18 mpg highway and 16 mpg combined while the 4×4 achieves 13 mpg city/17 mpg highway/15 mpg combined. My test vehicles featured this engine and it performed nicely on roads that varied from winding hills at various speeds and inclines to highway driving. The Tundra was a pleasure to drive and it handled well. Toyota also offers a 4.6-liter, DOHC i-Force V8 offers 310 horsepower at 5,600 rpm and 327 foot-pounds of peak torque at 3,400rpm that gets slightly better fuel mileage. 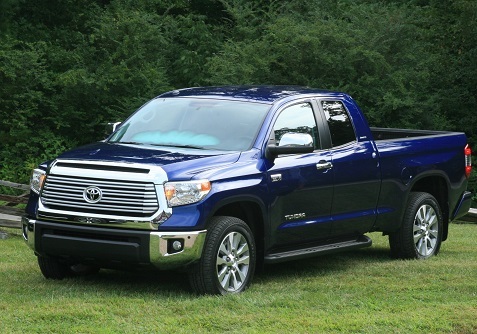 Buyers can also choose a 4.0-liter Dual Overhead Cam (DOHC) V6 which is standard on Tundra Regular and Double Cab models and produces 270 horsepower at 5,600 rpm and 278 foot-pounds of peak torque at 4,400 rpm. It is paired with a five-speed automatic transmission with uphill/downhill shift logic. EPA-estimated fuel economy is 16 mpg city, 20 mpg highway and 17 mpg combined. Drivers can control the driving experience to adapt to road surfaces or driving conditions. In “normal” mode, Vehicle Stability Control (VSC), Traction Control (TRAC) and Automatic Limited-Slip Differential (Auto-LSD) all function to help enable traction and control capability. These modes can then be turned off to adjust to various conditions. Toyota executives are stressing the “American-born” nature of the new Tundra which should play well with buyers in this segment. The redesigned Tundra was once again engineered by Toyota Technical Center in Ann Arbor and the design was created by Calty Design Research centers in Newport Beach and Ann Arbor. The Tundra is assembled in San Antonio and its V6 and V8 engines are built in Alabama while transmissions are built in North Carolina. The large truck segment is very competitive with excellent products, but it’s also growing like crazy as the economy improves. The new Tundra will definitely catch the eye of buyers and we recommend test driving it if you’re looking for a big truck. Toyota has a well-deserved reputation for durability and reliability which is important if you’re looking for a workhorse. Acura practically invented the segment for luxury CUVs with three rows with the introduction of the first MDX in 2001, and now Acura is introducing the third generation of this vehicle with the 2014 model year with significant upgrades over the previous model. The market for 7-passenger luxury CUVs in now crowded with very healthy competition from other luxury brands, but Acura will remain very competitive with this all-new MDX. I had the opportunity to drive the new model and I came away very impressed. The changes to the exterior design of the MDX aren’t dramatic, as Acura sticks with its wedge-shaped grille for the front end, but the Jewel Eye LED headlights give the vehicle a much more modern look and feel as you can see from the photos above. The new headlights also provide superior road light and visibility as well. Acura slightly altered the size of vehicle, making it slightly narrower and longer. The new MDX is two inches longer with a 2.8-inch longer wheelbase which helps to enhance ride quality. Meanwhile, the vehicle width was reduced by 1.3 inches. The frontal area of the vehicle is also 2-percent smaller which helped to provide for greater aerodynamic efficiency. While the vehicle looks more modern with a number of refinements to the design, it retains the sporty essence that makes it an attractive option in this segment. Acura strived to make significant improvements to the interior of the MDX with the goal of creating “synergy between man and machine.” The result was a very luxurious and practical driving experience that will appeal to buyers in this segment. The overall feel is modern and sophisticated and I experienced a very comfortable drive that will meet the expectations of the target market. I particularly liked the improvements to the center stack. The center console storage area is large and well thought out with a handy slot for mobile phone storage. The sliding lid above the storage area and below the leather-trimmed top is equipped with rubber strips which prevents items like phones from sliding around. 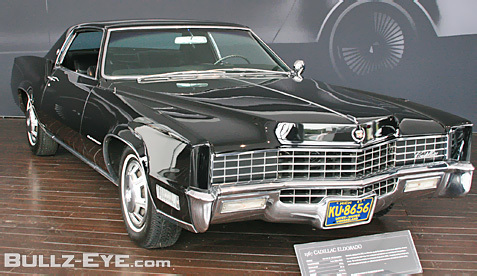 Another feature that stood out for me was the turn-by-turn navigation feature in the main dashboard which compliments the main navigation system in the center stack, letting drivers see instructions in their direct line of site without needing to turn their heads to the main display panel in the center stack. The MDX also features a new 7-inch color On Demand Multi-Use Display touchscreen with haptic feedback which helped to reduce the number of hard buttons in the center stack from 41 to 9. Extended Slide second-row seats the process of getting into the third row is now much easier. The new MDX is powered by a direct-injected 3.5-liter 24-valve V-6 engine, generating 290 horsepower at 6,200 rpm; 267 lb-ft at 4,500 rpm and 267 lb.-ft. of peak torque. The aluminumV-6 engine is paired with a reengineered 6-speed automatic transmission that provides reduced friction and smoother gear changes. 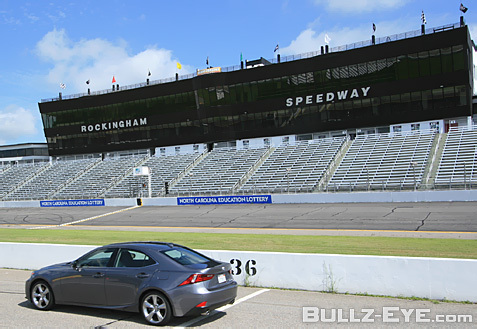 I drove the all-wheel drive model and was very impressed with the responsiveness and acceleration. I’m partial to vehicles that offer different driving modes so I was happy to see that the MDX offers Sport, Normal and Comfort modes. You can really have fun with the Sport mode option and the paddle shifters, and when you’re stuck in slower traffic you can save more fuel with the Comfort mode. Speaking of fuel, the 2014 MDX also achieves best-in-class fuel economy with 18/27/21 MPG city/highway/combined for the AWD package. The MDX is a family-friendly vehicle that also meets the expectations of luxury buyers. It’s a beautiful vehicle, inside and out, and it’s loaded with all the luxuries and amenities you’d expect from today’s luxury vehicles. Buyers with families will also appreciate all of the safety features as well. 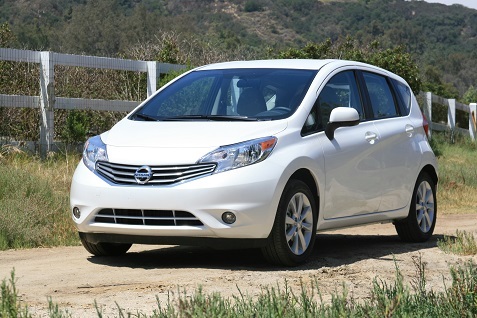 Prices range from roughly $42,290 for the base 2-wheel drive model to $56,505 range for the fully loaded SH-AWD model. If you’re in the market for a luxury CUV the MDX should be on your list.